Most people join and stay in UNISON to get the best representation and support at work when they need it. But UNISON members also receive superb membership benefits – you could save the cost of your subscription many times over. UNISON members can get free legal advice on any matter not related to work from UNISON’s solicitors. This service entitles you to receive a 30-minute telephone interview with a solicitor. Click the link or phone UNISON Direct on 0845 355 0845 for more details. UNISON’s very own holiday destination offering fantastic holidays for people of all ages. Croyde Bay’s Oasis Leisure complex provides tropical warmth and fun for everyone with its indoor heated pool, sauna, spa bath and gym. UIA offers a range of competitively priced insurance products to members of UNISON and have a history of supporting trade union members for over 100 years. We are a mutual company so there are no shareholders expecting a share of any profits which are re-invested in the company to help keep our premiums low for members. Make the most of your UNISON membership and don’t miss out on your FREE £5,000 of Accidental Death Cover! Cover lasts for 12 months however you can renew it every year for free and acceptance is guaranteed for UK residents aged 18-64. Simply go to UNISONProtect.com to find out more and apply online. We’ll do the rest. After your application you’ll receive a call from us to take further details, set up your cover and explain other benefits available. With the security of ABTA membership and instant discounts on holiday brochure prices, flights and ferry travel, a call to UNISON Travel Club will be well worth your while. UNISON Welfare is a registered charity providing help to members and their families in times of financial hardship or personal difficulties. In the first instance, contact the Branch Office. 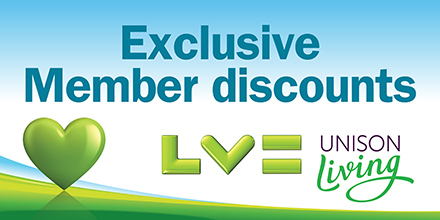 UNISON have joined forces with Vision Express Opticians to provide you and your family with substantial savings on eyecare.